Lissa Bryan: In Flanders Fields... The "Forgotten War"
In Flanders Fields... The "Forgotten War"
This Memorial Day, I'm remembering World War I. 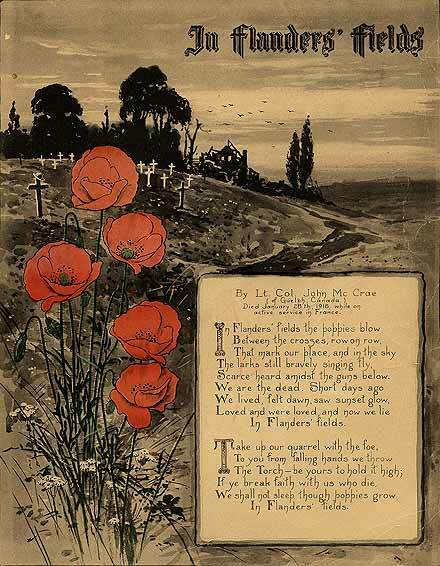 When the guns fell silent on November 11, 1918, an estimated seventeen million people -- military and civilians -- were dead, another twenty million wounded. The numbers seem impossible to believe now, but almost a million casualties came from the Battle of Verdun alone. Perhaps the Great War was overshadowed by the second world war, which broke out a scant twenty years later. Here in the United States, there is no national monument. Hollywood has mostly ignored it. The last of our veterans, Frank Buckles, has passed. No one really knows how many American soldiers served in WWI. The records are spotty. "Nobody—not the Department of Veterans Affairs, or the Veterans of Foreign Wars or the American Legion—knew how many there were," says Richard Rubin, author of the forthcoming book "The Last of the Doughboys." As far as he could tell, "that chapter of history was closed." Nor do we know how many were fallen. Looking at the records, you will find battlefield estimates and a myriad of troops listed as "missing." At Verdun, their bones still surface from the soil, anonymous forever. My first novel, Ghostwriter, is a story of a man who witnessed some of these terrible battles, serving in the American Field Service ambulance corps. No monument exists to the brave men and women who drove rickety Model-Ts into battlefields, dodging shells and poison gas. They are remembered only in a museum exhibit in France. But from among their number emerged some of our greatest writers: Hemingway, E.E. Cummings, Somerset Maugham, and Gertrude Stein, just to name a few. Today, I'm remembering the fallen, the forgotten. The veterans of the Great War, the "war to end all wars," who suffered for the cause of freedom and lived to see history repeat itself as the following generation forgot the mistakes of the past, and the world erupted in another bloody conflict. For them, I'll wear a poppy. Very touching, and so true, Lissa. One of the saddest events to come from that war took place at the Somme, when an entire unit of 160 men was slain by a single German machine-gunner placed atop a hill at the edge of a cemetery. I created four characters to tell of it in a story titled "Machine-gun At the Crucifix", found in a short story collection titled "From the Shadows Of My Soul", on Amazon. It might be of interest to you. Thank you, Steve Wise. I'll check that out. There are so few representations of the Great War in fiction, which is probably why its horrors have faded from our collective memory. One of my hopes in writing "Ghostwriter" was to honor the memory of some of our forgotten heroes. thank you for posting this. the past few years (where i live) i haven't seen any veterans with their poppys. i was in a small southern town the other day, and i saw somne ladies from the American Legion with the poppys. i got a couple, and gave them a donation. i told them i was giving the poppys away, and wanted to be sure the white tag was on them. i thought it gave an explanation of the poppy. the ladies asked me to wait, and they gave me a larger sheet with a detailed explanation. they then asked me, "do you know why we have the poppy?" i said, "yes, it's because of Flanders Field." they were surprised i knew. they told me not a lot of people know that. as it saddened me to hear that, however it made these ladies very happy that someone knew. i have a large poppy on my door, and one i will wear as well. i wish more Americans thought more of Memorial Day than just a paid Federal holiday. thank you again for your post. it was very touching. Thank you. I'll be searching for those American Legion flower sellers myself today. There used to be a fellow who sold them in front of the grocery store every year; I haven't seen him in a few years.